for 10 GB? If Verizon no longer offers the $45 for 2 GB plan, do you think they updated the BYOP SIM Kit? That’s a very good question. I’m not sure if the 2GB plan still exists I can only say they don’t advertise it on verizonwireless.com. Both the plans and the website have changed since I signed up and did my review. When I ordered my kit, there wasn’t a $45 service card or PIN inside the kit like some other prepaid wireless services have. The credit was automatically applied to my account when I signed up. As of today, Feb 7 2017, I think your best option in not to order that specific kit online. The best option would be to head to Walmart and check there. For the last few months, Verizon and Walmart have been adding an extra 2 GB to the plans for customers who buy in store. That makes the plans $50 for 7 GB and $70 for $12 GB. I haven’t made it to Walmart to check out that offer, but a number of people are talking about it in the comments. Now, I’m not sure if that is a limited time offer but I think it is. And I’m not sure if that extra 2 GB of data lasts for the the lifetime of your account or just a limited time promotion. Now, if that promotion is over, or you would prefer to sign up to use the $50 or $70 prepaid plans and Bring Your Own Phone, I’m going to show you how I would do it. And if you do decide to sign up online, I suggest you check the video description below or my article on smartphonematters.com. I have an affiliate link for Verizon Wireless and if you use it when you sign up you’ll help support my channel at no additional cost to you. I’ll also update the article on smartphonematters.com with any current deals or special offers over time. Now, starting on Verizon Wireless.com, Click Shop, Plans & Services, and Prepaid Plans. Now, choose between Single or Multiple Devices. I’ll choose single. Now, you’ll need to choose between “I’m with Verizon and “I’m not with Verizon”. I’m going to choose I’m not with Verizon. But before we go on, I’m going to say don’t click the I want to pick my plans first option. For some reason, it doesn’t show the prepaid plans options. Now you’ll enter the MEID of your phone to check eligibility. Choose whether you have or need a sim card, I’ll choose need a SIM card. 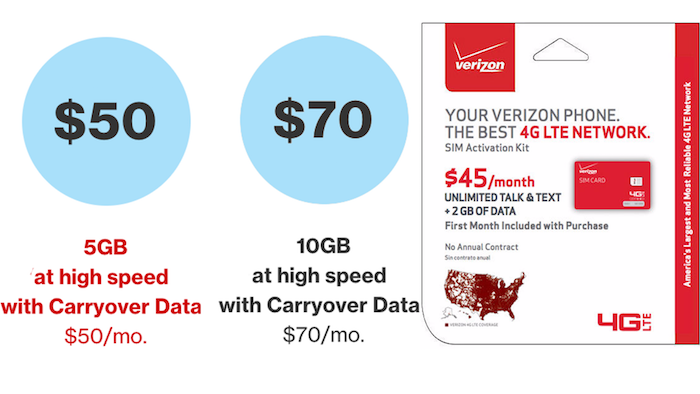 And now finally, you’ll have the option to choose between the New Verizon plan (postpaid) and Prepaid. When you choose the prepaid option the $50 for 5GB plan is automatically added to your cart. You can then edit your cart to choose the options. If you use the affiliate link below when you sign up for Verizon Wireless you’ll be helping to support smartphonematters.com at no additional cost to you.Verizon Prepaid, now with Always on data. Stay connected even after you have used your high speed data. Oh, I told him it was the Walmart sim kit. They said it was basically $45 for 2gb & $5 for the sim, that was why it was $50. I’m not complaining about the service expiring on the same day every month, actually it seems a lot easier to remember. I just thought all prepaid plans lasted for 30 days. No I wasn’t implying you were complaining.I am glad you pointed it out. I think I missed that point in my review. Glad it worked out. I was in Walmart on Sat. I saw the signs for the Walmart deal. They didn’t have any SIM kits at all. I don’t think they though it the Walmart promotion for BYOD and SIM Kits. that’s why you had the issue. With 30 day billing you get 360 days service for 12 payments. With Verizon’s billing you’ll get 365 or 366 days service for 12 payments.